MANILA -- After the amnesty given to Senator Antonio Trillanes IV was invalidated by President Rodrigo Duterte, the Department of Justice (DOJ) on Friday filed another motion for the issuance of an alias warrant of arrest and hold departure order (HDO) before the Makati City Regional Trial Court against him, this time for the rebellion case in connection with his involvement in the 2007 Manila Peninsula Hotel siege. The four-page motion was filed before Judge Elmo Alameda of the Makati City Regional Trial Court (RTC) Branch 150, who has been asked to issue the arrest warrant and HDO against Trillanes. Alameda handles the rebellion case against Trillanes and his co-accused over their involvement in the 2007 Manila Peninsula siege. “The nature and urgency of the relief prayed for necessitate an ex parte application by the People for an HDO and a warrant of arrest precisely so as not to defeat the purpose of the said court processes,” read the motion signed by officer-in-charge (OIC) Prosecutor General Richard Anthony Fadullon, and Assistant State Prosecutor Mary Jane Sytat following Duterte’s issuance of Proclamation No. 572, which invalidates the Department of National Defense Ad Hoc Committee Resolution No. 2 issued on Jan. 31, 2011 insofar as the amnesty granted to Trillanes. However, the DOJ informed Alameda that President Duterte issued Proclamation 572, which declared Proclamation 75 as “void ab initio (void from the beginning)." “It is clear that this instant case is still pending with this Honorable Court, as the prosecution has yet to present its evidence in chief insofar as accused Trillanes in concerned,” the DOJ said. “Accused Trillanes is an incumbent Senator of the Republic. He has the means and resources to flee to another country in order to escape Philippine criminal jurisdiction. It is therefore imperative that a hold departure order be issued directing the Commissioner of the Bureau of Immigration (BI) to prevent him from leaving the Philippines during the pendency of this case,” it added. Last Tuesday, the DOJ also filed a motion before Makati RTC Branch 148, asking the court to issue an arrest warrant and HDO against Trillanes. Retired RTC Branch 148 Judge Oscar Pimentel handled the coup d’etat case against Trillanes and his co-accused over the 2003 Oakwood mutiny. Branch 148 is now under Judge Andres Soriano. The filing of the motion at Branch 150 came three days after they filed a similar motion before Makati RTC Branch 148. Fadullon said that it took them longer to file the motions before Branch 150 because in Branch 148, he was the prosecutor in the coup d’etat case against Trillanes and the records were still with him. Unlike the rebellion case, it was handled by a different prosecutor and they had to look for the prosecutor-in-charge and the records. 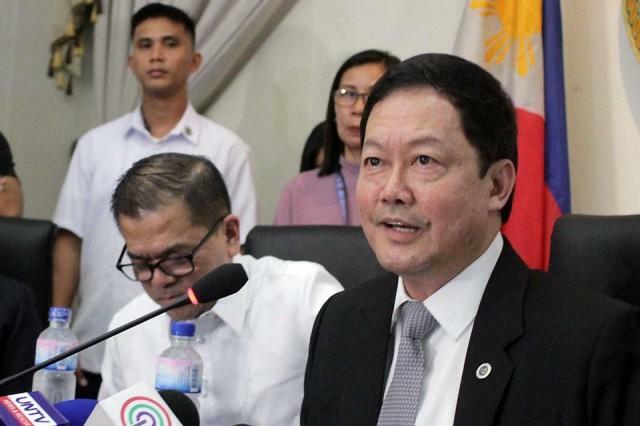 The Prosecutor General also said that while Trillanes has asked the Supreme Court (SC) to issue a temporary restraining order (TRO) against the implementation of Proclamation 572, he expressed doubt that it would stop the two Makati courts from coming out with their decisions. “It does not follow. The filing is different from granting. He filed for petition for TRO and until and unless it is granted there is no reason for the RTC not to continue with the proceedings because these are criminal cases,” he added. The camp of Trillanes, led by his lawyer Reynaldo Robles, filed a petition before the Supreme Court, seeking the issuance of a TRO against President Duterte's Proclamation 572.